Benjamin Franklin once said that an investment in knowledge pays the best interest. College and university tuition costs can seem intimidating, but the reward is worth the investment. College graduates may be more likely than non-grads to achieve their career goals and earn higher salaries. 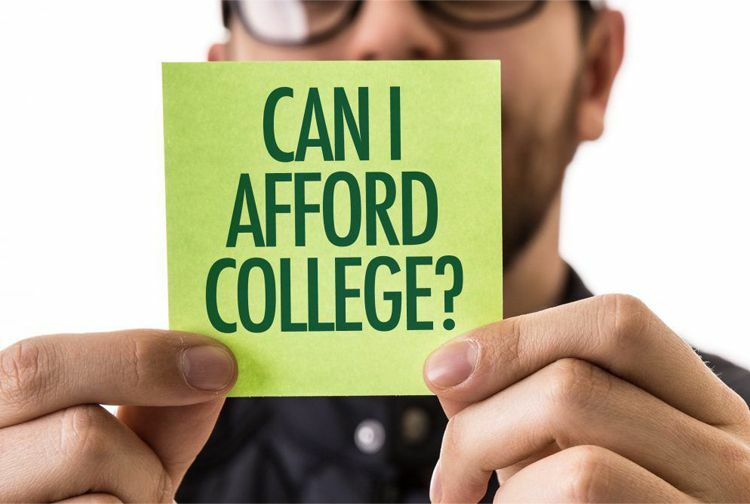 Tuition costs appear to be daunting at first glance, but once students see how financial aid can help manage their costs through loans, grants and external scholarships, the possibility of attaining a college degree becomes a reachable goal. Today’s students have a wide array of options to assist with both the direct and indirect costs of pursuing a college degree. Financial aid is available in many forms, ranging from federal or private grants and loans to scholarships, employer-run tuition assistance programs and military assistance to active-duty service members and veterans. This financial aid guide is designed to walk you through the process of researching, identifying, and applying for the financial assistance that is right for you. Understanding financial aid may seem like a daunting task at first, but applying for and obtaining assistance is actually quite intuitive and easy. Before you get too far along in your quest for a college degree, put together a snapshot of your financial situation and the available financial aid options. The federal government-run program Free Application for Federal Student Aid (FAFSA) is designed to assist with the process. Set up an account on the website and answer the question, which range from simple demographics – name, address, and date of birth, for instance – to your preferred schools, tax status, and financial information. When you’re done, sign the document electronically and submit your completed FAFSA application package. FAFSA stores the information in its servers so you can use it to apply for grants, loans, and a number of other financial aid options. Create an account/obtain your Federal Student Aid (FSA) ID – FSA IDs are essentially usernames and passwords that remain with you throughout your entire student career. Start filling out FAFSA – Be sure to choose the correct school year on the first page of the FAFSA form. For example, if you plan to attend college between July 1, 2018 and June 30, 2019, choose the 2018-19 FAFSA. Also, the beginning of the form includes a “save” key, which lets you return to the form later if necessary. Complete the demographics section – Fill out the sections on personal information. Full legal name, address, Social Security number, and other identifying information go in this section. List the schools to which you are applying – The form lets you choose up to 10 schools. When the form is completed, your information will be sent to the selected institutions. Determine dependency status – Whether a student is considered a legal dependent of a parent or legal guardian determines the course of the rest of the FAFSA form. Complete parent demographics section (if applicable) – Students who are legal dependents of a parent or guardian should fill out this section. Names, addresses, and other identifying data of the parent/guardian go here. Prove your financial information – An IRS Data Retrieval Tool (DRT) lets you or your parents/guardians (if applicable) log in to the IRS website and automatically populate FAFSA fields with verified tax return data. Applicants who are unable to use the DRT need to supply paper copies of tax returns to the school to which they are applying. Electronically sign and submit FAFSA form – FAFSA lets you and your parents/guardians sign the form digitally with FAS IDs. If you forget your numbers you can use the FSA ID retrieval tool. When everything is signed, the form can be officially submitted. College financial aid departments use completed FAFSA forms to obtain the necessary financial aid for students who want to enroll in their programs. FAFSA forms must be completed every school year until graduation, even if students are attending full-time. When the FAFSA has been filed and processed, each school you’ve applied to send you an award letter itemizing the aid that’s available to you based on tuition, expected family contribution, how far along you are in your program, and whether you are attending school full-time or part-time. Federal Pell Grant – Undergraduates without either a bachelor’s or other professional degree may receive a Pell Grant up to $5,730 per semester (for no more than 12 total semesters). Federal Supplemental Educational Opportunity Grant (FSEOG) – Some undergraduates with exceptional financial need may have access to up to $4,000, depending on funding availability at a particular school. Teacher Education Assistance for College and Higher Education Grant (TEACH) – Undergraduates and graduate students alike may be eligible for up to $4,000 per semester if they are willing to sign an agreement that they will teach full-time in a high-need field after graduation. If students fail to uphold the agreement, the grant is converted to a direct unsubsidized loan. Direct Subsidized Loan – When undergraduates qualify for a subsidized loan due to financial need, the U.S. Department of Education (DOE) will pay the interest on the loan as long as the student actively pursues a their degree and for a period of deferment after graduation. The amount of the loan depends on the student’s grade level, but can reach up to $5,500 per semester. Direct Unsubsidized Loan – Both undergraduate and graduate students qualify for unsubsidized loans regardless of financial need. The borrower is responsible for all of the interest on the loans, which can be approved for amounts up to $20,500 depending on grade level and dependency status. Direct Plus Loans – Parents of undergraduate and graduate students can qualify for direct plus loans regardless of the student’s financial need. Interest rates are slightly higher than the subsidized and unsubsidized loans, but the maximum amount can cover the total cost of attending school, minus the amount of other financial aid contributions. Just because you qualify for financial aid doesn’t mean you have to accept whatever is offered. If scholarships or private grants are already in place, you may accept only the federal loans and grants necessary to cover whichever costs have not been covered yet. Applicants should explore all available options and work up a personal budget to determine what they can contribute to their education expenses. Federal student aid rarely covers all education expenses. Tuition itself can exceed $30,000 at private colleges and $20,000 at public institutions per school year. Textbooks and supplies also figure into the total expenditure required to get a college degree. Private student loans essentially work like any other type of bank loan. Unlike federal loans, private loans take the student’s credit score into account. Most require that repayment begin immediately, although some allow repayment of only the accrued interest each month while students are still in school. For those who do not qualify for private loans by themselves, co-signers are allowed. Co-signers are usually parents or family members with outstanding credit scores. Students are still expected to pay the loan themselves, but if they fail to do so, the bank will expect repayment from the co-signor. Also, the co-signer’s better credit score means better terms on the loan. Some private loans can have high interest rates or “introductory offers,” which offer rates that are low at first but that increase dramatically after a given period of time. Students should research the terms of private loans before making a decision. Most grants, either federal or non-federal, do not require repayment and are typically need-based awards. Different types of grants can be used for different purposes, ranging from specific types of students (based on gender, minority ethnicity, or income level for example) to educational goals (such as healthcare or education majors). Numerous private or public organizations, both for-profit and not-for-profit, offer a range of grants. In fact, a student could conceivably get several grants for the same reason. For instance, a Native American student might qualify for more than one minority grant through different organizations. Some grants, especially those for specific degree programs, are known as grants-for-service and typically act as a binding contract. A grant-for-service contract means that students receive the grant as long as they agree to work in that field, often for the specific company or organization that paid for the grant. While grants are generally need-based financial aid, scholarships typically award money based on student merit. High school football players, for example, may qualify for athletic scholarships at a college or university with a football team. Every scholarship has its own application process and procedure, so students should be prepared to do a lot of individual research into the various programs. Many scholarships have extensive requirements for essays, letters of recommendation, and transcripts. Scholarships are available for students in many walks of life. Scholarship search engines designed to assist students in finding the right scholarships are available on the internet. Veterans or military members on active or reserve duty have several financial aid options open specifically to them. A large proportion of military members is eligible for tuition assistance, and each branch determines specific criteria for qualification. Online programs are popular among servicemen and women because of the long, odd hours they work, the travel involved with training and temporary assignments, and their overseas deployments. In fact, the Veterans Administration reports that between 2011 and 2012, 18 percent of military students took all of their classes online. If you are serving in the military and would like to pursue a college degree, contact your base’s education office for details. The staff will be able to give you information on partnerships with local schools, policies on transferring credits, college credit for military experience programs, and CLEP/DANTES testing, which allows service members to receive college credit by testing out of a subject. The GI Bill (both the Montgomery and Post-9/11 varieties) provides a predefined monthly stipend that can be used by a military veteran (or in some cases, active duty members who meet certain requirements) when attending college either full- or part-time. College admissions offices can activate your GI Bill benefits, which will be transferred directly to your bank account, not the college. Many veterans receive financial aid through grants and loans and use their GI Bill for living expenses while they attend school. Others use the GI Bill to pay for their college tuition directly, or to pay for textbooks and supplies. Many companies make Tuition Assistance (TA) available to their employees. Many workers would like to qualify for promotions or management positions that come with higher pay and increased responsibilities. Tuition Assistance Programs let employers provide up to $5,250 per year, tax-free, to workers attending either undergraduate or graduate programs. Like the GI Bill, TA money is given directly to the student and is often used to pay for the incidental expenses associated with attending school, such as supplementing lost income, covering bills, or paying for textbooks/supplies. Many companies may also offer scholarships and grants in addition to tuition assistance. Students considering one of Maryville University’s many online degree programs may be eligible for a range of financial aid options. Both need- and merit-based assistance, including grants, loans and external scholarships, may be available to those who qualify. One of the university’s goal is to make education affordable and accessible to help deserving students fulfill their potential. Maryville’s Financial aid experts and admissions personnel stand ready to help students apply for financial aid, find external scholarships for which they may qualify, and explore private grants and loans. Maryville’s skilled advisors constantly help students fit full-time online college programs into their existing schedules. Whether you are full-time working parent and/or spouse, a service member on 24-hour shifts, or a recent high school grad looking to pursue an online college education, Maryville University has an online program that can accommodate your needs!